There were some one-off contributing factors, such as the depreciation in the pound leading to a spike in demand for £50s, and a jump in the £5 growth rate as a result of the introduction of the new polymer notes given paper notes will take time to be returned. 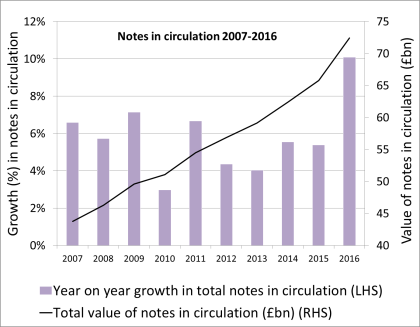 Controlling for these events, by substituting in their 2015 growth rates, notes in circulation grew by 8%, the highest rate for over 10 years. One factor driving this is low interest rates incentivising increased hoarding, so notes remain in wallets and the retail sector for longer. 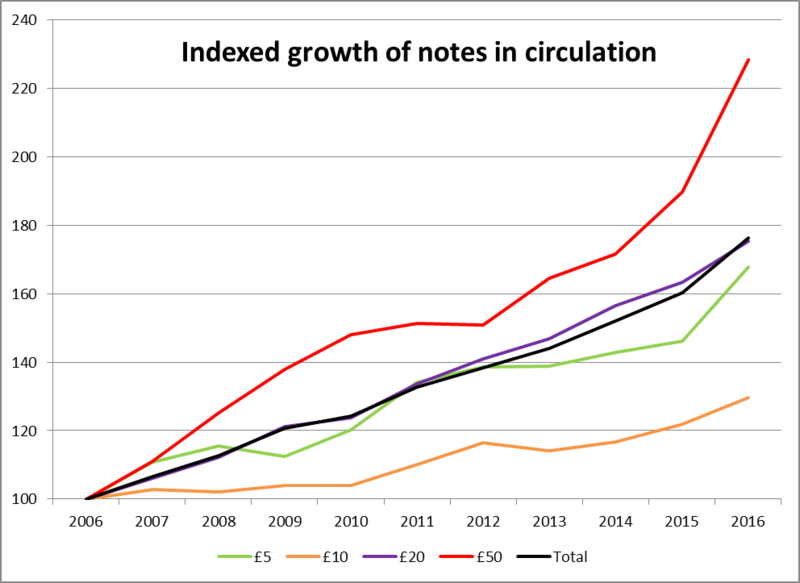 Banknote growth has been continuous, despite cash’s popularity as a payment method declining. In 2015, cash accounted for less than half of consumer payments (volume) for the first time. This paradox of falling transactional use of, but rising demand for, notes is faced by many other countries. Will this trend continue? Central banks need to understand the future of cash as it impacts decisions on how many notes to order from our printers and how the distribution network may evolve. We need to understand whether we can rely on the past to predict the future, or whether a tipping point is on the horizon as the use of electronic payments gathers pace and the macroeconomic environment changes. Cordelia Kafetz works in the Bank’s Note Operations Division. Previous Post Taking a long hard look in the mirror: should the leverage ratio reflect Pillar 2? Next Post Do core and transitory volatilities matter for the economy? Speaking as a typical citizen / consumer I see 5 to 10 notes being offered in payment for goods every day. I have never ever seen a £50 note offered. So what are £50 notes used for? I suspect for nefarious purposes. Also, a minor criticism of the above article: it is not entirely clear from the above article whether the rise in value of bank notes out there is adjusted for inflation or not. One chart does say “indexed” which I assume means adjusted for inflation. But can the “adjusted for inflation” point be made clearer?